New Delhi: India’s e-commerce market, dominated by Flipkart Pvt. Ltd and Amazon.com Inc., can potentially grow more than fourfold to $150 billion by 2022, fuelled by rising incomes and a surge in internet users, according to a latest report. During the period, the size of India’s middle-class is expected to swell to 540 million from 380 million in 2017, showed the report by software industry lobby group Nasscom and consulting firm PwC India. The e-commerce market was pegged at $36 billion last year. “A ‘Make-for-India’ solution approach along with conducive policy environment can potentially make e-commerce a $150 billion market by 2022 with a globally leading compounded annualized growth rate of 35%," the report said. The number of internet users is expected to nearly double to 850 million in five years from 450 in 2017, the study showed. Of the total, 150 million users are expected to transact digitally and will emerge mainly from tier-2 and 3 cities with diverse language choices, payment modes and products. “The next frontier for the battle in the Indian e-commerce industry is set to be fought around a seamless shopping experience, building digital trust, voice-based or conversational commerce and creating an inventory of localised content," said Sandeep Ladda, partner and global technology, media and telecom sector leader at PwC India. The report included e-travel, e-tail, financial services such as e-wallets and insurance, consumer services ( classifieds and e-services) and digital content segments. Business to commerce is excluded from the study. The report includes gross merchandise value in e-tail and e-travel; transaction margins in online financial services; commission and ad revenues for online consumer services; and subscription and ad revenue for the digital content category, according to the report titled Propelling India towards global leadership in e-commerce. The mushrooming e-tail market is expected to grow at a compounded rate of 30% each year to exceed $60 billion in market size by 2022. By then, video subscriptions in the digital content segment will also quadruple, the report said. During the period, internet penetration is forecast to more than double to 60%, with the sector expected to create one million jobs with 15 million small and medium companies generating revenue. While Flipkart and Amazon are attracting buyers by offering deep discounts, even new startups are able to lure new Indian consumers, said Debjani Ghosh, president at Nasscom. E-tail and e-travel are the dominant sectors in e-commerce marketplace model, while omni-channel and inventory-led models are also making inroads, she said. The fastest-growing segment in e-commerce business is online financial services, due to a spurt in the number of startups promoting digital transactions for money transfers and loans, among other services. India has 26% penetration in online financial transactions, but is lagging far behind China which has 62% penetration, according to the report. Given the rapid expansion of India’s e-commerce market and increase in foreign investment, the industry has come under the lens of lawmakers and regulators in the past five years. Among the myriad of laws that govern the industry, the new draft-e-commerce policy recommends strict regulations on online retail, including curbs on discounts, which has caused an uproar in the industry. Mint reported on 7 August that both Flipkart and Amazon were lobbying fiercely to get the draft e-commerce policy scrapped. “A weak version (that restricts sellers to buy in bulk and offer discounts on platforms) of the draft e-commerce policy is available and everybody is referring to that. There are some good things about the policy that incentivize more SMEs to come online….I hope the government will use that and not create a stifling environment and the potential highlighted in the report can be realised, while taking into account customers data and other imperatives, which needs to be addressed but not only by the way which the policy suggests," said Sangeeta Gupta, senior vice-president at Nasscom. On the global e-commerce readiness index, India at 10% ranks behind countries such as Brazil (20%), China (30%) and Russia. 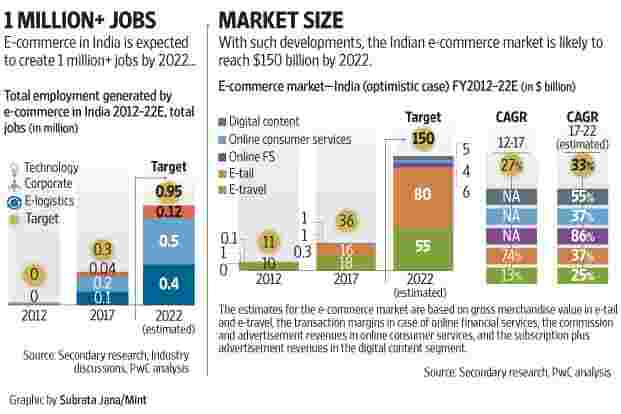 “With demand drivers in place, Indian e-commerce maturity can match that of China’s and Russia’s in 5-6 years," the report said. The report also highlighted certain challenges that the e-commerce business in India faces currently such as low ease of payments and longer delivery periods. “On the other hand, the ability to serve these customers may also be constrained due to limited assortment, low ease of ordering and payment, longer delivery times and trust issues," said Sankalpa Bhattacharya, partner and leader in deals strategy at PwC India. India’s e-commerce industry is expected to contribute 4% of GDP by 2022, the report said.